Rebbe laments post-Pesach rush to bakeries and the fights that often ensure. 'People fighting over bread forget their humanity'. After a week without leavened bread, some shoppers are anxious to head for the nearest bakery following the end of the Passover holiday. In recent years, crowds of impatient customers have gathered around bakeries in religious neighborhoods in Israel, with some taking the hunt for hametz just a little too far. Speaking to his Hassidim on Shabbat, the Vizhnitz Rebbe, Rabbi Yisrael Hager, decried the phenomenon of post-Pesach fights, as crowds of shoppers looking to pick up the first loaves of bread sometimes turn violent. 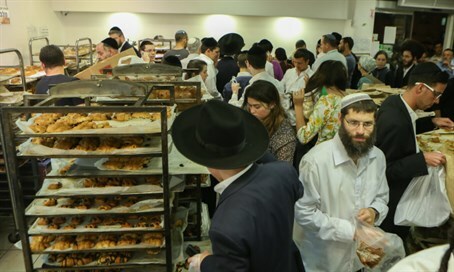 “There are some who run [to get bread] when it comes time to eat leavened bread, but that’s not suitable for Hassidim and Torah students,” he said.